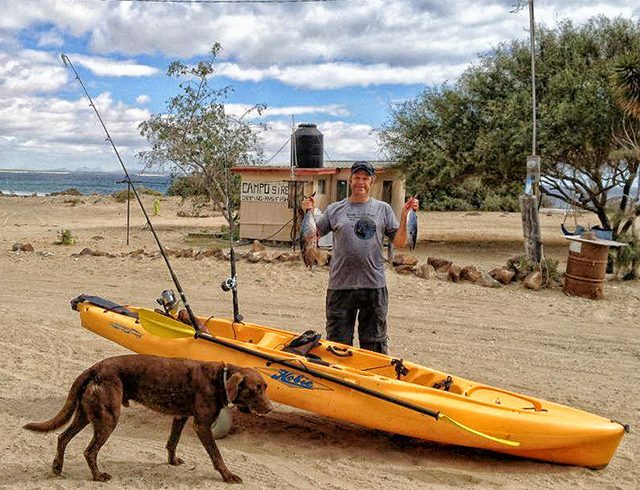 Discussion in 'Baja Bytes By Gary Graham' started by Baja Bytes, Nov 13, 2017. As many of you know, Don Holden sold “Bella Gato” to Bill Vessels last week. 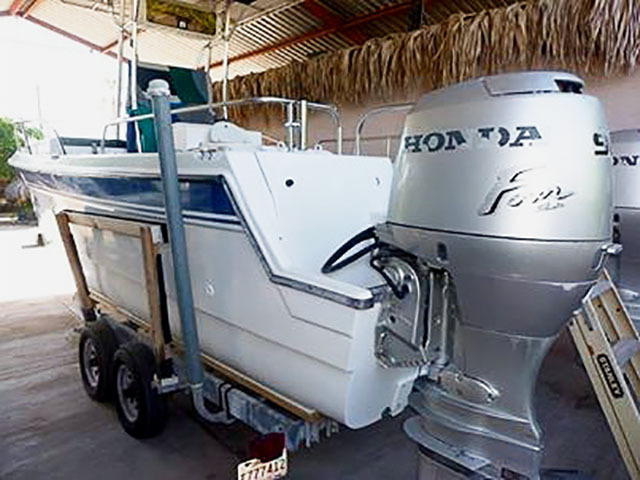 Bill and his wife took the boat to L.A. Bay and last night, after they had anchored the boat near the launch ramp in L.A. Bay, someone stole the boat and trailer during the night! There has been some good yellowtail and bonito action lately, with a very occasional bluefin in the mix. The yellowtail fishing has mostly been a sonar/meter-mark deal, so if you fish for them, you’ll want to motor around slow enough that your electronics can pick up marks in mid-water and the lower half of the water column in 20- to 30-fathoms of water. The main zone has been on the flats to the northeast of North Island with a few more yellows cruising around Pukey Point and the weather side of North Island. The yellows are mostly in the 8- to 10-pound range but there are some fish up to about 25-pounds in the mix. Since the fish are hanging in mid-water and deeper, yo-yo iron and dropper loop fin bait are going to be your best bets for getting bit. If you dump some chum on a mark, you might be able to get them to come up higher in the water column and eat fly-lined bait, but most private boats don’t have the capacity to unload enough chum for this. There are also still bonito mixed in and around the yellowtail and scattered throughout the entire island chain, and an occasional 15- to 30-pound bluefin can sometimes be caught around the tuna pens at the south end of South Island. Not much word from the Rockpile lately. DasPerdyGood checked in today from the Islands. 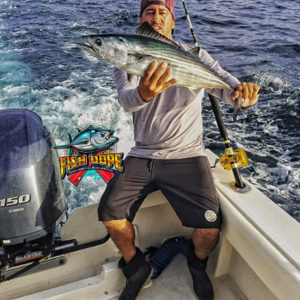 He found lots of birds working short of the Islands on course from San Diego Bay and caught several bonito before pushing on to the Islands proper, where he found more bonito. He said there were birds, life, and bonito everywhere but he couldn’t find any yellowtail. I was just there last week when we towed a boat from San Quintin. Weather was mild and surprisingly, the fish were very willing to participate in the action … probably because the water temps are still warm. I was telling Jaime that we seemed to have done better this time of year than in the summer. This week’s fishing action seems to have corresponded with where the fishermen were fishing! That usually is the case in our area. The magic formula for fishing is being at the right spot at the right time. 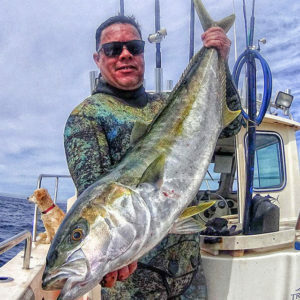 Yellowtail have traveled up from the deeper waters north of Coronado and popped out near “Matate” on the Island’s west side. Close to the same spot we have been seeing schools of sardina being herded by 12 to 16-inch “baby” roosterfish. Pargo are mixed in with the yellowtail with most fish running in the 12-pound range. Nothing over 18-pounds has been landed here or farther out at Lobo all week. 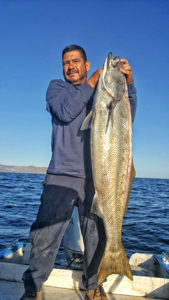 Roosterfish in the 40-pound range have been working bait along the coast from La Picazon all the way up to San Bruno. frame. 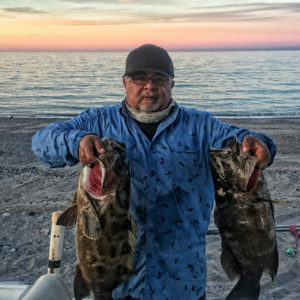 Early in the week we felt the season’s first real consistent wind patterns from the north develop; this made for much tougher fishing conditions in the direction of the Gordo Banks, Iman and San Luis Banks. 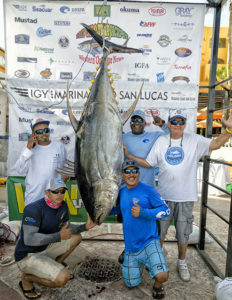 Last weekend the Los Cabos WON Tuna Jackpotwas held and local La Playita team “Estrella del Norte” with team Captain James Rosenwald and mate/angler Adrian Miranda, who caught the winning 338-pound yellowfin tuna, taking home a cool quarter of a million dollars for their efforts. Congratulations to them! 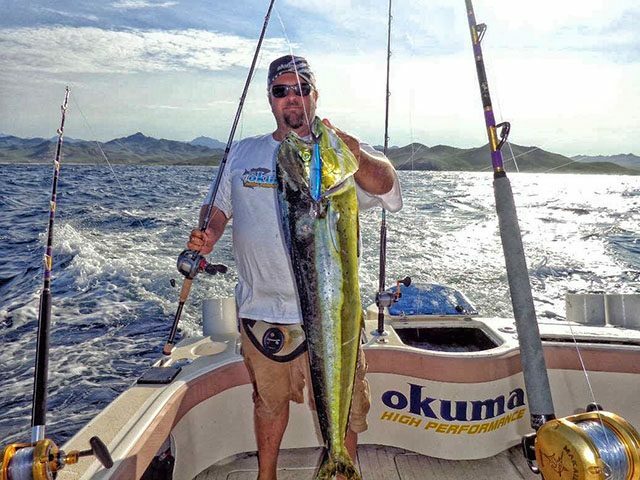 In tune up for the event last week, on Tuesday, a 323-pound yellowfin tuna was caught from the panga, Killer II, with skipper Chame Pino; in last week’s report we mistakenly did not mention the angler who landed that fish … this was local Los Cabos resident Jack Dudenhoeffer. This week we had several other cow-sized tuna landed, including Michael Aviani’s 220-pound tuna, Miguel Angeles with a 234-pound tuna and Walter Korbler with a 221-pound fish, all taken off of Gordo Banks. Targeting the larger-sized tuna required lots of patience and stockpiling larger quantities of bait … sardina, squid and chunks of skipjack were all used. The majority of the largest tuna were hooked on either chunks of skipjack or strips of squid. There were also nice-sized tuna to over 100-pounds landed while fishing theSan Luis Bank, though that was tough through much of the week due to North Winds. There were no big numbers of these larger fish, but some anglers did account for one, two and even three in one morning. Most common-sized tuna being caught were more in the 7- to 15-pound class; these hit mostly on the sardina, with Iman Bank and Palmilla Point being the hot spots on particular days. Dorado were much more scattered than the tuna; limited numbers of these fish were accounted for … more juvenile-sized with an occasional fish to 15-pounds. 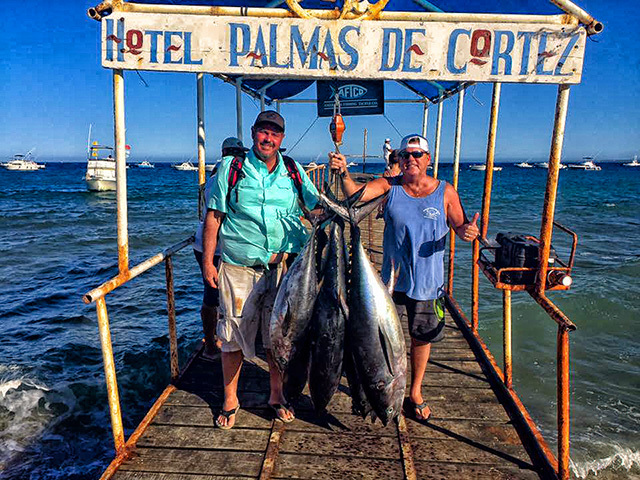 We embarked on my Dad’s and my first trip to Cabo and fished Saturday, Sunday, and Monday morning with Renegade Mike’s Sportfishing. Mike runs a top-notch operation with a focus on Customer Service. With four of us, my dad who turned 70 this year, a co-worker and his son, and me. Our mission was to catch as many fish as possible on our prototype Okuma Andros 12- and 16-size, two-speed reels and to put them to the test. Day one we went offshore looking for dolphin and the tuna that would be with them. With storms the previous week, no one really knew where the fish would be. We struck out offshore and headed in toward the beach where there had been some marlin caught that morning. Cabo Climate: Mostly sunny and warm days with a daytime average of 84.8 degrees and nights at 72.5. The average humidity ratio was 65.5% for the week. Sea Conditions: The Finger Bank and southerly, across the Golden Gate Bank and the Jaime Bank, down across the 1000 Fathom Curve, are at 81-82 degrees. Cabo Falso and southerly to the Herradura is also at 83 degrees. The 95 Fathom Spot and northerly to the 1150 Fathom Spot, up across the Gorda Banks and on to Los Frailes, are at 83.5-degrees. Tropical surface breezes flowing in from the southwest averaged 8.14 mph for the week with lots of clean water in most all directions. 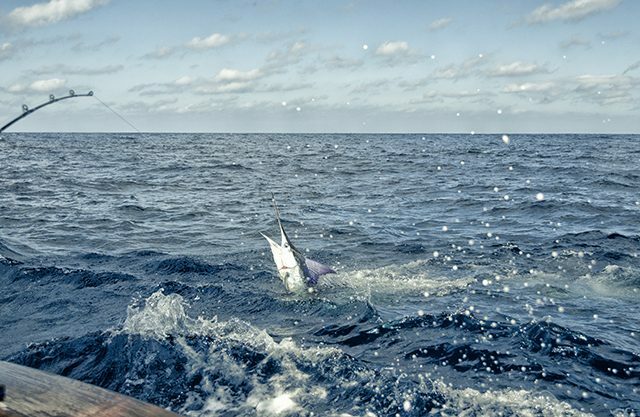 Best Fishing Area(s): Most of the billfish were taken in the area of the Herradura and the Jaime Banks. 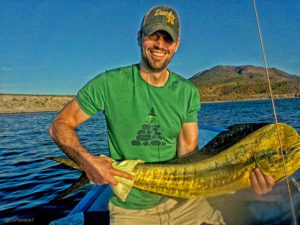 Dorado and the tuna were taken in a variety of regular spots that have been producing well over the past several weeks. Best Bait-Lure: The billfish bite was best on rigged bait with a few taken on live bait. 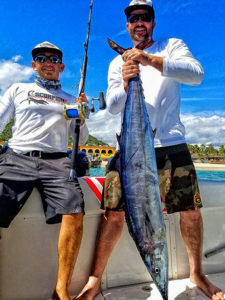 The tuna taken mostly on feathers of different colors and dorado taken on live bait, rigged bait and an assortment of trolled artificials. repo805 and Tunahead like this. quite a day, 100 marlin released....my god ya what next? Reel hip and Baja Bytes like this. Great detailed report Gary as usual. Just waiting for my next trip! Well bummer me, have a torn Deltoid,Rotator Cuff maybe too. Fish win. fish next season again. These reports keep my spirits up bigtime!